Rubbing to edges and corners bumped. Spine and covers creased. Pages browning. Name and address is book belongs to box. Another exciting story from your favourite writer. 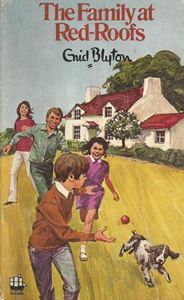 The Jackson family, boys and girls, mother and father, their maid Jenny-Wren, their queer little garden-boy Jackdaw and their dog Bundle, face disaster. It may mean that they have to separate. The story of how they manage to avoid this by good, luck, hard work and sticking together is one that you will be unable to put down.